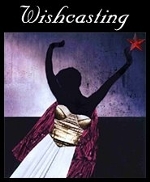 It's Wishcasting Wednesday so the gorgeous soul Jamie Ridler is inviting us to cast our wishes into the universe. This week Jamie asks, "What guidance do you wish for?" I wish for guidance in my writing. Guidance might come in the form of ideas from my muse, inspiration from other writers, or a gentle nudge from the universe reminding me to write anyway (even if there is only a few minutes, even if I don't know what I'm about to write). It might be in the form of encouragement or accountability. I've avoided writing long enough for various reasons and excuses. Valid or not, I'm ready to stop talking and start doing. This week I brushed off a short scene I wrote last summer and took it to a writer's group. It was my very first writer's group experience. I didn't know what to expect or what to bring, but I went anyway. I left with lots of encouragement from the two other people there. Since then I made some notes for how my scene might grow in to a full novel along with questions I would need to answer. What guidance do you wish for? Those are some might good steps toward your goal. As you wish for your self, so I wish for you also.